"The man brought me back to the entrance to the temple, and I saw water coming out from under the threshold of the temple toward the east (for the temple faced east). The water was coming down from under the south side of the temple, south of the altar. He then brought me out through the north gate and led me around the outside to the outer gate facing east, and the water was trickling from the south side. As the man went eastward with a measuring line in his hand, he measured off 1,700 feet and then led me through water that was ankle-deep. He measured off another 1,700 feet and led me through water that was knee-deep. He measured off another 1,700 feet and led me through water that was up to the waist. He measured off another 1,700 feet, but now it was a river that I could not cross, because the water had risen and was deep enough to swim in — a river that no one could cross. Then he led me back to the bank of the river. When I arrived there, I saw a great number of trees on each side of the river. 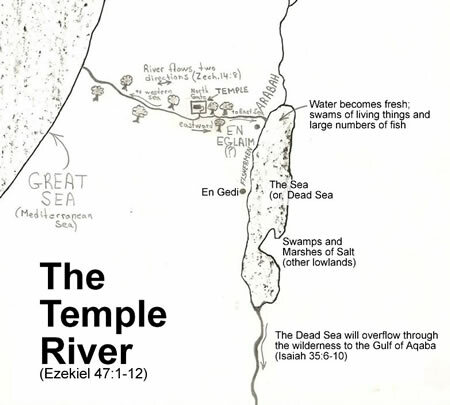 Ezekiel’s angelic guide leads him to the eastern side of the temple where Ezekiel sees water flowing eastward out of the temple from under the threshold of the temple entrance. The water was flowing like a spring of water down the south side of the eastern steps of the temple and out the eastern gate of the city after passing by the altar in the inner court on the south side and then through the outer courts of the temple mount. As the water flowed towards the east the flowing stream became a river that progressively became deeper and deeper as it flowed through the valleys and wadis towards the Dead Sea. Four times Ezekiel is told to measure the distance of 1,700 feet, which is about a third of a mile (or, 1,000 cubits). Ezekiel finds the river getting deeper and deeper at each of the four points going from ankle-deep to knee-deep to waist deep until it was over Ezekiel’s head and impossible to wade across. Further investigation by Ezekiel reveals that one of the main features of this spring of water was that it formed a life giving river. 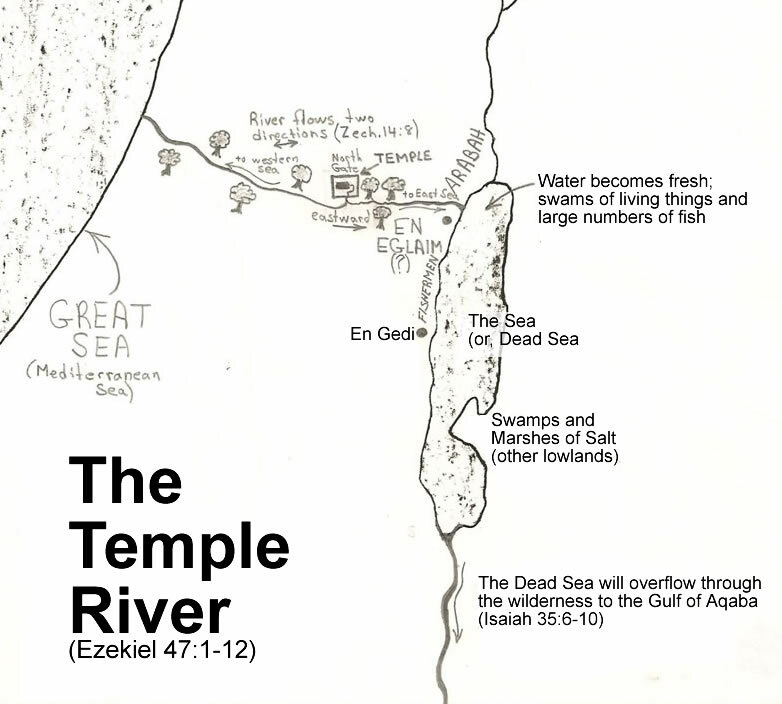 Ezekiel notices a large number of trees flourishing on both sides of the river and that the Dead Sea (or, Salt Sea) became fresh with a large number of fish and swarms of living creatures living in what was now the Living Sea! Do I follow God or do I merely follow my own heart and desires? Do I follow the Spirit and the Word or am I following the ways of man and cultural standards? I will follow the truth of the Word of God and allow the Spirit to lead me to think, reason and act like Jesus. 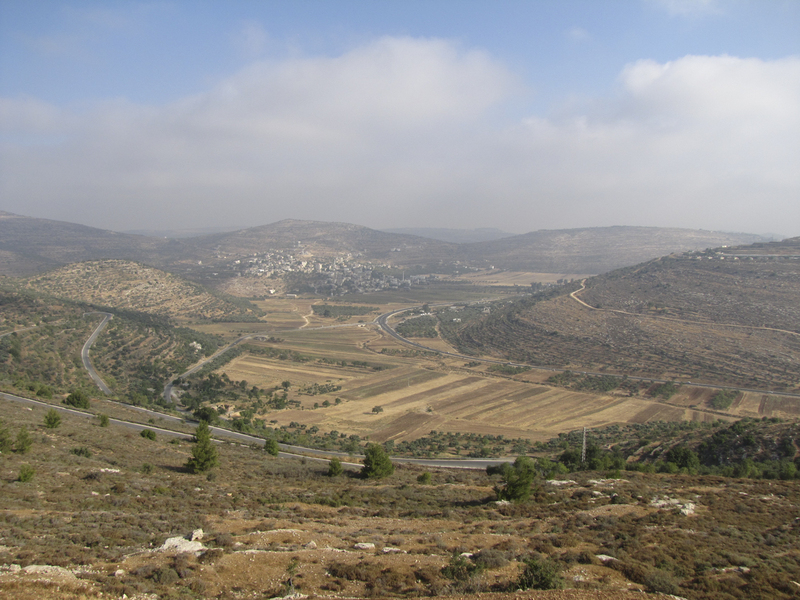 The road (mentioned in Judges 21:19) in the Hill country of Benjamin that goes from Lebonah, straight ahead in the photo, to Shiloh, to the right off the photo. 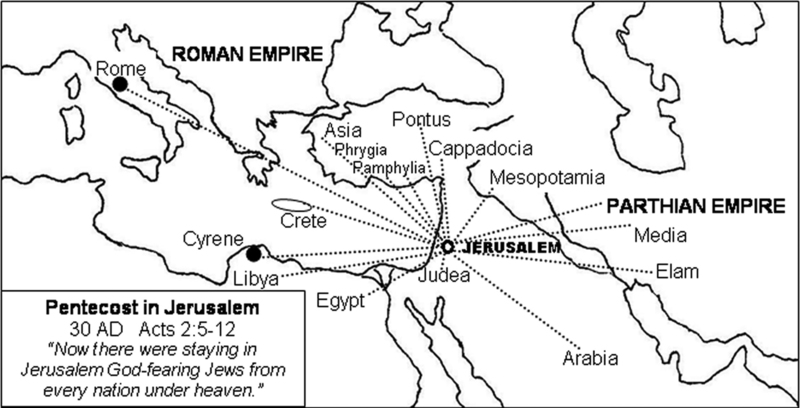 Details of the cities and lands represented in Jerusalem on the Day of Pentecost in 30 AD according to Acts 2:5-12. • Turning Water into Wine at Cana (2:1-11) – Jesus is the source of God’s future blessings. • Healing of the Nobleman’s Son (4:43-54) – Jesus is the Giver of Life Today. • Healing the Man at the Pool of Bethesda (5:1-15) – Jesus is the co-worker with God the Father. • Feeding of the Five Thousand (6:1-15, 22-69)– Jesus is the Source of Life. • Storm on the Lake and Jesus Walking on the Sea (6:16-21) – Jesus is Divine. • The Healing of the Blind Man (9:1-41) – Jesus is the giver of Physical and Spiritual of Sight. • Raising of Lazarus from Death (11:1-44) – The Person Jesus is the Resurrection and the Life. The Resurrection is not a “time” or “day”. It is a person. 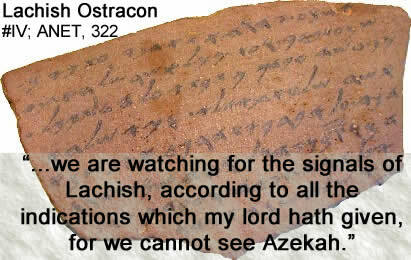 Part One: The Lachish Letters (or, Lachish Ostraca) are a collection of eighteen Hebrew correspondence written on potsherds from the days of Jeremiah during Nebuchadnezzar’s invasion of the land. The letters were found in the 587 BC destruction level and are clearly records of communication of Judah’s military in its final stand against Babylon written most likely in 589-588 BC. The greatest miracle is salvation. The godliest spiritual manifestation is the transformed soul. 5 So Ezra rose up and put the leading priests and Levites and all Israel under oath to do what had been suggested. And they took the oath. 6 Then Ezra withdrew from before the house of God and went to the room of Jehohanan son of Eliashib. While he was there, he ate no food and drank no water, because he continued to mourn over the unfaithfulness of the exiles. 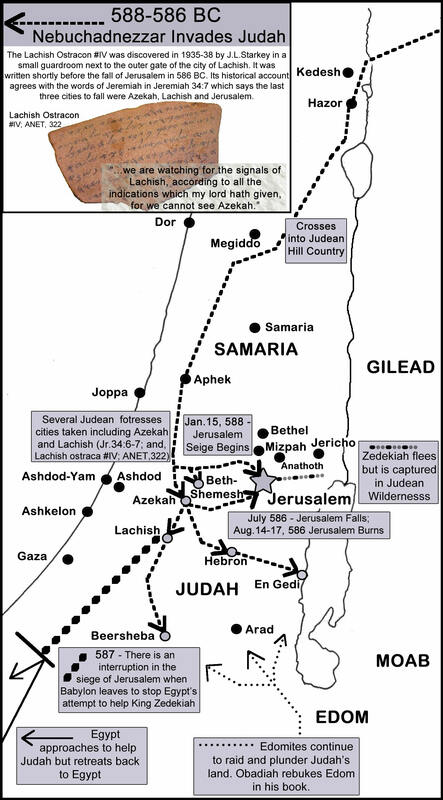 7 A proclamation was then issued throughout Judah and Jerusalem for all the exiles to assemble in Jerusalem. 8 Anyone who failed to appear within three days would forfeit all his property, in accordance with the decision of the officials and elders, and would himself be expelled from the assembly of the exiles. 12 The whole assembly responded with a loud voice: “You are right! We must do as you say. 13 But there are many people here and it is the rainy season; so we cannot stand outside. Besides, this matter cannot be taken care of in a day or two, because we have sinned greatly in this thing. 14 Let our officials act for the whole assembly. Then let everyone in our towns who has married a foreign woman come at a set time, along with the elders and judges of each town, until the fierce anger of our God in this matter is turned away from us.” 15 Only Jonathan son of Asahel and Jahzeiah son of Tikvah, supported by Meshullam and Shabbethai the Levite, opposed this. 16 So the exiles did as was proposed. Ezra the priest selected men who were family heads, one from each family division, and all of them designated by name. On the first day of the tenth month they sat down to investigate the cases, 17 and by the first day of the first month they finished dealing with all the men who had married foreign women. Maaseiah, Elijah, Shemaiah, Jehiel and Uzziah. Elioenai, Maaseiah, Ishmael, Nethanel, Jozabad and Elasah. Jozabad, Shimei, Kelaiah (that is, Kelita), Pethahiah, Judah and Eliezer. Ramiah, Izziah, Malkijah, Mijamin, Eleazar, Malkijah and Benaiah. Mattaniah, Zechariah, Jehiel, Abdi, Jeremoth and Elijah. Elioenai, Eliashib, Mattaniah, Jeremoth, Zabad and Aziza. Jehohanan, Hananiah, Zabbai and Athlai. Meshullam, Malluk, Adaiah, Jashub, Sheal and Jeremoth. Adna, Kelal, Benaiah, Maaseiah, Mattaniah, Bezalel, Binnui and Manasseh. Eliezer, Ishijah, Malkijah, Shemaiah, Shimeon, 32 Benjamin, Malluk and Shemariah. Mattenai, Mattattah, Zabad, Eliphelet, Jeremai, Manasseh and Shimei. Maadai, Amram, Uel, 35 Benaiah, Bedeiah, Keluhi, 36 Vaniah, Meremoth, Eliashib, 37 Mattaniah, Mattenai and Jaasu. Shimei, 39 Shelemiah, Nathan, Adaiah, 40 Maknadebai, Shashai, Sharai, 41 Azarel, Shelemiah, Shemariah, 42 Shallum, Amariah and Joseph. Jeiel, Mattithiah, Zabad, Zebina, Jaddai, Joel and Benaiah. 44 All these had married foreign women, and some of them had children by these wives. 3 And he said to me, “Son of man, eat what is before you, eat this scroll; then go and speak to the people of Israel.” 2 So I opened my mouth, and he gave me the scroll to eat. 3 Then he said to me, “Son of man, eat this scroll I am giving you and fill your stomach with it.” So I ate it, and it tasted as sweet as honey in my mouth. 12 Then the Spirit lifted me up, and I heard behind me a loud rumbling sound as the glory of the Lord rose from the place where it was standing. 13 It was the sound of the wings of the living creatures brushing against each other and the sound of the wheels beside them, a loud rumbling sound. 14 The Spirit then lifted me up and took me away, and I went in bitterness and in the anger of my spirit, with the strong hand of the Lord on me. 15 I came to the exiles who lived at Tel Aviv near the Kebar River. And there, where they were living, I sat among them for seven days—deeply distressed. 16 At the end of seven days the word of the Lord came to me: 17 “Son of man, I have made you a watchman for the people of Israel; so hear the word I speak and give them warning from me. 18 When I say to a wicked person, ‘You will surely die,’ and you do not warn them or speak out to dissuade them from their evil ways in order to save their life, that wicked person will die for their sin, and I will hold you accountable for their blood. 19 But if you do warn the wicked person and they do not turn from their wickedness or from their evil ways, they will die for their sin; but you will have saved yourself. 22 The hand of the Lord was on me there, and he said to me, “Get up and go out to the plain, and there I will speak to you.” 23 So I got up and went out to the plain. And the glory of the Lord was standing there, like the glory I had seen by the Kebar River, and I fell facedown. 24 Then the Spirit came into me and raised me to my feet. He spoke to me and said: “Go, shut yourself inside your house. 25 And you, son of man, they will tie with ropes; you will be bound so that you cannot go out among the people. 26 I will make your tongue stick to the roof of your mouth so that you will be silent and unable to rebuke them, for they are a rebellious people. 27 But when I speak to you, I will open your mouth and you shall say to them, ‘This is what the Sovereign Lord says.’ Whoever will listen let them listen, and whoever will refuse let them refuse; for they are a rebellious people. 4 “Now, son of man, take a block of clay, put it in front of you and draw the city of Jerusalem on it. 2 Then lay siege to it: Erect siege works against it, build a ramp up to it, set up camps against it and put battering rams around it. 3 Then take an iron pan, place it as an iron wall between you and the city and turn your face toward it. It will be under siege, and you shall besiege it. This will be a sign to the people of Israel. 4 “Then lie on your left side and put the sin of the people of Israel upon yourself. You are to bear their sin for the number of days you lie on your side. 5 I have assigned you the same number of days as the years of their sin. So for 390 days you will bear the sin of the people of Israel. 6 “After you have finished this, lie down again, this time on your right side, and bear the sin of the people of Judah. I have assigned you 40 days, a day for each year. 7 Turn your face toward the siege of Jerusalem and with bared arm prophesy against her. 8 I will tie you up with ropes so that you cannot turn from one side to the other until you have finished the days of your siege. 16 He then said to me: “Son of man, I am about to cut off the food supply in Jerusalem. The people will eat rationed food in anxiety and drink rationed water in despair, 17 for food and water will be scarce. They will be appalled at the sight of each other and will waste away because of their sin.